The mission of First Baptist is to worship God, The Father in spirit and in truth, to proclaim the gospel of Jesus Christ. To encourage people to find salvation in Jesus Christ. To nurture believers and equip them for the work of ministry, to minister to those in need and to provide an atmosphere for Christian fellowship and prayer, all under the direction of God The Holy Spirit, according to Christ's example. 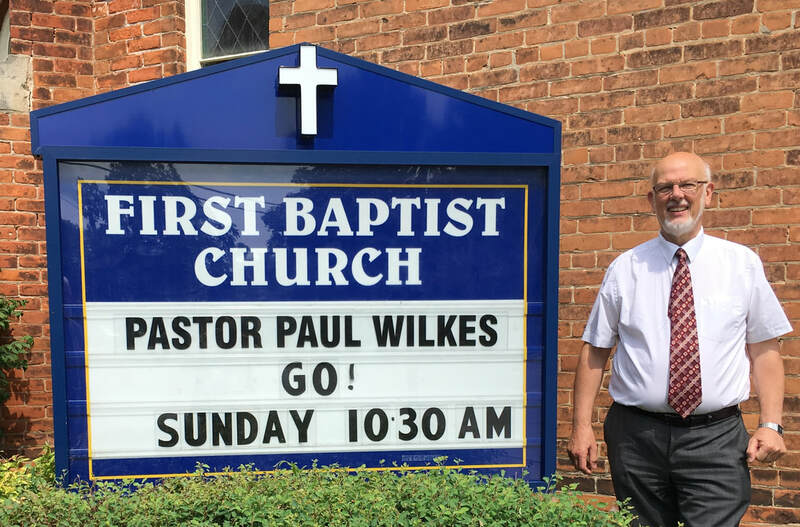 Our Pastor is Paul Wilkes, who is leading the Worship Services at First Baptist Church. Our Worship services are basic and traditional: we hear God’s Word from the Bible every Sunday at 10:30; we love to sing the old favorite hymns (although we might sing something from Bill Gaither or Andrae Crouch, too); and we welcome everyone to share the age-old message. Pastor Wilkes came to Canada from his native Wales in 2005 after meeting his wife Sandy via a Christian Internet site, and during his time here, has pastored in Barrie, where he was Co-ordinator of Spiritual and Religious Care at the IOOF Seniors Home since 2006. He also has served as an interim pastor at First Baptist in Collingwood and knows and loves the community. His messages are based on Biblical teachings, wisdom and practical life skills. And from time to time, he likes to lead the singing by playing the accordion or the piano. The Baptist cause was established in Collingwood on October 7, 1873 by thirteen charter members who met first in a stable. During the next three years, the Reverends Ross, Woodward and Northrop gave pastoral leadership for this fledgling work. In 1876, the Rev. James Coutts came to minister to a congregation nearing 100. During his pastorate, plans were made to build a church. The members and friends of the Church, known officially as First Baptist, built a brick building at the corners of Third and Pine Street, the location to this day. Upon completion of the building, a donation of lumber was received and the members laid the first boardwalk, which completely encircled the block on which the Church stood. Since that day, many pastors have come and gone, many souls have been saved, served and ultimately entered the Eternal Kingdom. The Church has also seen many young men go into the ministry of the Gospel of Jesus Christ as both pastors and missionaries. We are proud to be a member of the Canadian Baptists of Ontario and Quebec (CBOQ). Learn more about CBOQ by clicking on logo.